Russell and Hill Sultan personal injury lawyers are here for you. Call us at 1-888-399-0921 and letâ€™s start figuring out the best way to get this behind you. Personal injury accidents happen every day. Whether the injury was caused by a car, bicycle, malpractice, or any other accident, individuals throughout the Sultan area suddenly have to deal with a long recovery process and financial losses. If you find yourself in this position, injured and unable to work, our experienced personal injury attorneys are ready to fight for you. We have served individuals throughout Washington and Oregon, pursuing full and fair compensation for every client. At Russell & Hill, PLLC, our team of attorneys have represented thousands of personal injury victims. We are well versed in the entire claim process, and with that experience and knowledge, we are able to build a powerful personal injury case for every client. Injured individuals can leave the stress and complications to us as we help them obtain financial compensation for everything from hospital bills to lost wages due to the injury. Financial loss can be one of the most stressful results of a personal injury. Medical bills pile up quickly, and future expensive doctor appointments are necessary. Since, in many cases, the injury prevents you from going to work, those hospital bills begin to loom. It is our priority to help you recover monetary damages for all your injuries and losses, including lost wages, hospital bills, and future medical needs. When our personal injury attorneys take on a case, they are meticulous in their investigation of the accident. We believe it’s important to work closely with every client in order to understand every detail of the case, including the injuries, costs, and losses that resulted from the accident. 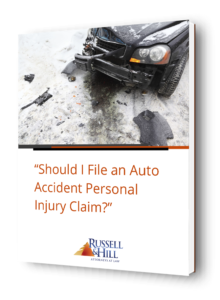 As we build your personal injury case, Russell & Hill, PLLC partner with outside experts to provide proof of the claim and help strengthen the case. To fully understand what caused the accident and who was at fault, we bring in accident scene reconstructionists to analyze property damage, skid marks, and other evidence. Together with vocational experts and medical testimony, these experts assist our attorneys in building the best possible case to present during SSDI proceedings. After completing the investigation and determining the cause of the accident, our attorneys will assess every monetary loss, cost, and damage. Upon assembling the necessary evidence, they will present your claim to the insurance company. Because we prepare every case to be successful in court and in a settlement, insurance companies take us very seriously. Our attorneys are passionate and aggressive when it comes to getting our clients’ their due compensation, and we put in the time and energy that it takes to make that happen. If you are a resident of the Sultan area and have been in a personal injury accident, our attorneys are ready to serve you. Contact Russell & Hill, PLLC, by filling out our injury evaluation form or calling us at 888-379-9517 to schedule a free initial consultation.